This equipment manufacturer's executive team decided to give back by bringing first-class weight rooms to high schools in need. When Andrew Hall made the decision to launch Arsenal Strength in 2015, he envisioned it filling a very specific niche in the fitness world. Lifters and fitness enthusiasts were getting tired of mass-produced anything—even big-box gyms—and small, high-end training centers were booming. At the same time, online fitness was exploding, particularly on Instagram, where a new breed of athlete was searching for unique, high-quality equipment to help show what was possible with the human body. Somewhere between these two Hall (pictured on the left above) knew there was a great business opportunity. Today, Hall is joined by ex-competitive bodybuilder Beano Wallace (pictured above on the right), and five-time Mr. Olympia Flex Lewis. Demand for the company's services has expanded from word of mouth and a steady stream of "Where did you get that?" questions about its unique equipment, such as the Pro Vertical Leg Press. But Hall and Wallace also lend their expertise to gym design, helping create elite facilities worldwide. "We've evolved into more of a consulting company than somebody who just sells you equipment," says Hall. "I help customers all the time work on their business plans to help them get positioned so they can get loans or investors to get up and running. We help them design the actual gym, choose the equipment, and get it installed." But as is often the case with successful companies, Arsenal also ended up going in directions that its founders never imagined. In December 2015, Wallace, the vice president for Industry Relations at Arsenal, noticed a post on Bodybuilding.com announcing the creation of a new foundation called Lift Life. The foundation's mission would be to design and build new strength-training facilities at selected high schools across the United States. Wallace had worked with Bodybuilding.com for years, helping their operations at events including the Arnold Classic, the Olympia, and the British Grand Prix. When he heard about Lift Life, it seemed like the perfect opportunity to bring together his and Hall's professional and personal goals. Little did they know how quickly they'd get a chance to take advantage of the opportunity. 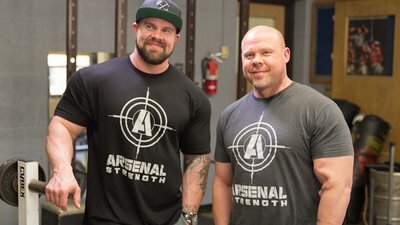 Once Hall and Wallace agreed that working with Lift Life made sense for Arsenal Strength, they called Bodybuilding.com and talked to Kirk Calzacorta, Bodybuilding.com's senior manager of brand marketing and program director for the brand new Lift Life Foundation. They learned that this wasn't just another grant program for underfunded schools, it was Bodybuilding.com's attempt to have a direct impact, one school at a time, with top-to-bottom weight-room renovations. They weren't just interested in adding a cardio machine here or a squat rack there, it was all new equipment, and given the state of many weight rooms, probably new electrical wiring and flooring to boot. Given Hall and Wallace's dual interests in equipment and gym design, it was right up their alley. "We talked to Kirk on a Thursday in early January 2016," Wallace recalls. "On Saturday, we got a call back from Kirk saying that they had found a project, were ready to start, and wanted to know if we'd be willing to be a part of it. Andrew and I were like, 'Yeah! Let's do this!' and we've worked hand-in-hand with Lift Life ever since." Lift Life's first project was in Bodybuilding.com's home state of Idaho. A student at Firth High School in the small town of Firth had contacted Make-A-Wish of Idaho after being diagnosed with cancer. Rather than meet his heroes or travel the world, Jared Anderson's wish was to see his high school's dilapidated weight room improved so everyone in his community could benefit from it. It was the perfect opportunity for Bodybuilding.com and Arsenal Strength to work together. Over a period of about two weeks, the Lift Life staff worked with not only Arsenal Strength, but also the Boise-based design company Catapult3 and a small army of volunteers and partners to transform the Firth weight room beyond Jared's wildest dreams. Lift Life has gone on to renovate two more school weight rooms. The second was Fulton High School in Arsenal's home city of Knoxville, Tennessee. The renovation was done in memory of 15-year-old Zaevion Dobson, a student athlete who, on December 17, 2015, was killed while protecting three young girls from gang-related gunfire. The most recent makeover was at Anderson Preparatory Academy in Anderson, Indiana. The local community has spent decades trying to recover from General Motors' decision to shutter its mammoth local plant, as well as from the 2008 recession. Anderson Prep, which uses a military model to help shape young students' lives, was feeling the downturn just as much as everyone else—including in their weight room. These schools now have state-of-the-art weight rooms, and students have a place to learn the values of hard work, pride, and teamwork—lessons that will help them make their way through the world. And the team of Lift Life and Arsenal Strength has already moved on to its next gym overhaul project. Barely two years into business, Arsenal Strength is growing as fast as the people using its equipment. It will soon open a new 10,000-square-foot headquarters outside of Knoxville, is working with a manufacturer to design and build a range of customized fitness machines, and is seeing explosive growth in its client base. Along with Hall's passion for creating great places to strength train, he and his partners are fueled by their compassion for those who don't have access to good gyms. Arsenal Strength works closely with Lift Life in an ongoing nationwide search for high schools desperately in need of new weight-training facilities. This has helped the company meet its community-involvement goals, connected it with educators and students across the U.S., and helped it build partnerships with companies that help Arsenal Strength deliver the best possible product. "We're not the kind of company that just sells equipment and walks away," Hall says. "We're dedicated to helping our customers in every way we can. But we also want to do all we can to help young people benefit from the rigor and discipline of weight training. Our ongoing mission is to help as many of them as we can."